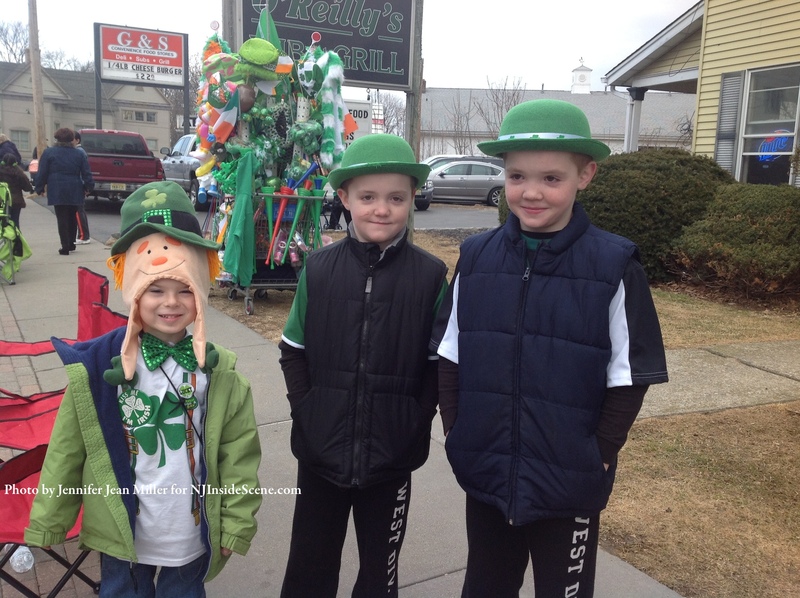 Three spirited Newton youngsters from left to right: Lucas Fox, age five, Jason Teets age eight and his brother Patrick Teets, also eight, are ready for the parade. Lucas and his mother passed out green fortune cookies to those they knew. Photo by Jennifer Jean Miller. 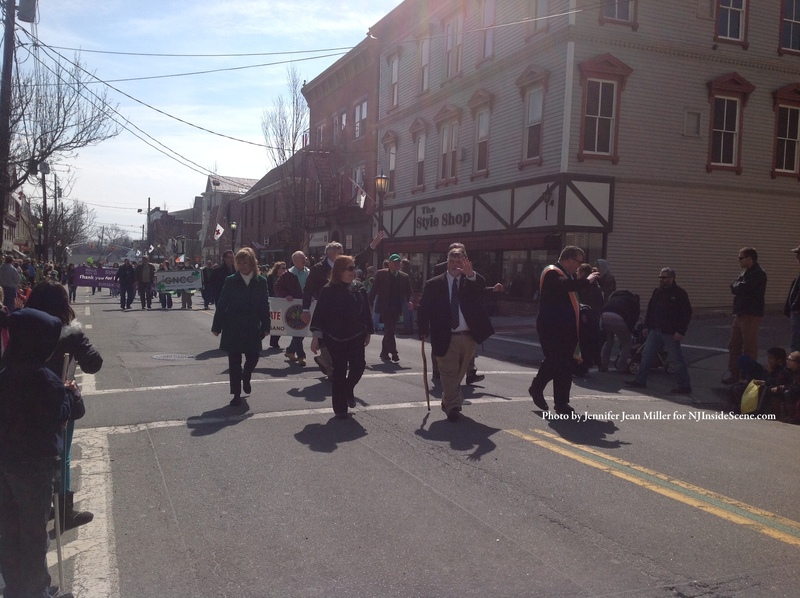 NEWTON – Spring Street in Newton was packed from its lower section towards Moran Street to celebrate the Sussex County St. Patrick’s Day Parade. An annual event that was conceptualized in 2003 and that happened in 2004 in Lake Mohawk, it has since grown and relocated to Newton, with attendees enjoying festivities from throughout the county and beyond, as parade participants and spectators. The Franklin Band was one of several groups that added to the musical end of the festivities. Photo by Jennifer Jean Miller. 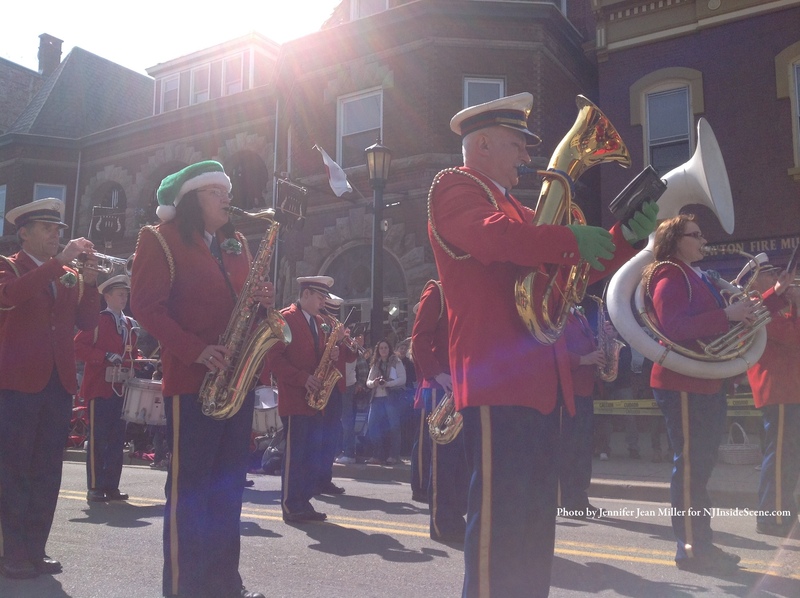 The parade was a welcome occasion for most, who have been cooped up during the snowy and frigid past winter. There were a few sprinkles just before the start of the parade, though the sun broke out and temperatures approximated into the 50s. 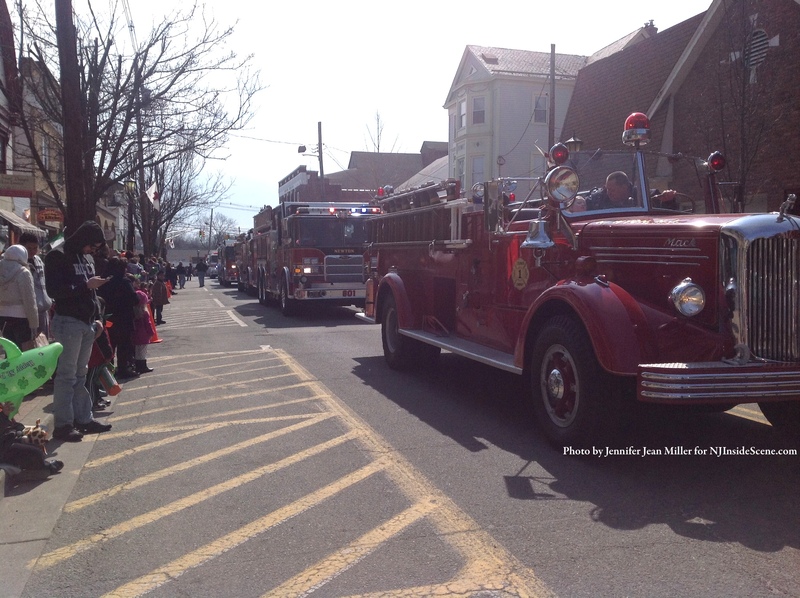 A line of firetrucks led by Newton’s prized Mack, made their way down Spring Street. Photo by Jennifer Jean Miller. Sussex County Dignitaries. Photo by Jennifer Jean Miller. The spectators were just as spirited as those marching, some even more. Many were dressed in St. Patty’s garb that included lively hats, bouncy antenna headbands, Shamrock-emblazoned shirts, printed pants and funky sunglasses. Even many of the four-legged friends in attendance were costumed. The parade had all of the traditional participants and more. There were police pipe and drum bands, military veterans, local dignitaries, organizations, area businesses, Irish Dance School troupes, political groups, WSUS and WNNJ radio stations, boy scouts and more. 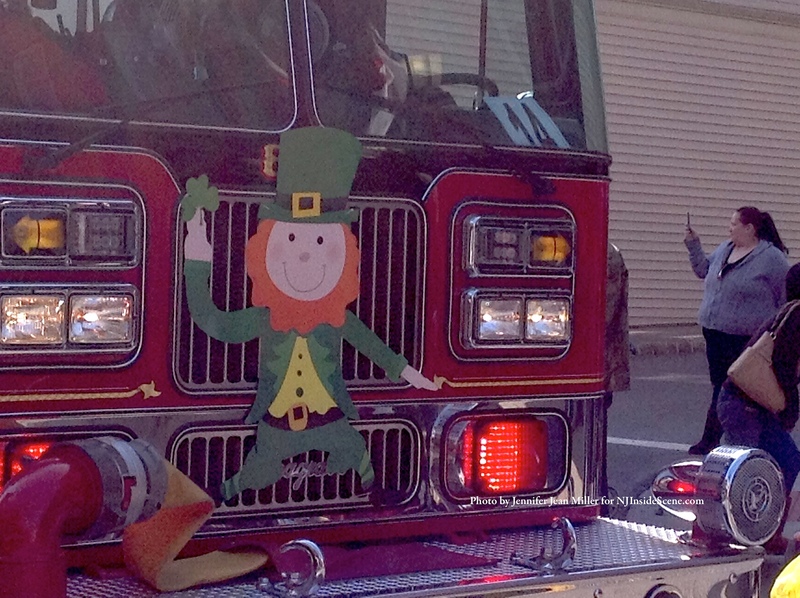 One of the fire engines sporting a leprechaun on front. Photo by Jennifer Jean Miler. Included in the participants was a long line of area fire departments including: the Town of Newton, Hampton Township, Andover Borough, Andover Township, Branchville, Byram Township, Franklin Borough, Fredon Township, Hamburg Borough, Lafayette Township and Stanhope Borough. Little Miss Newton and Little Mr. Newton also rounded out the parade, waving to spectators along the parade route, followed by a bevy of beauties that participated in the 2013 Queen of the Fair Pageant. Among them were Miss Newton, Miss Stillwater, Miss Lafayette, Miss Sparta, Miss Ogdensburg and Miss Green. The young ladies tossed green carnations to spectators from atop a vehicle courtesy of the New Jersey Antique Engine Club. 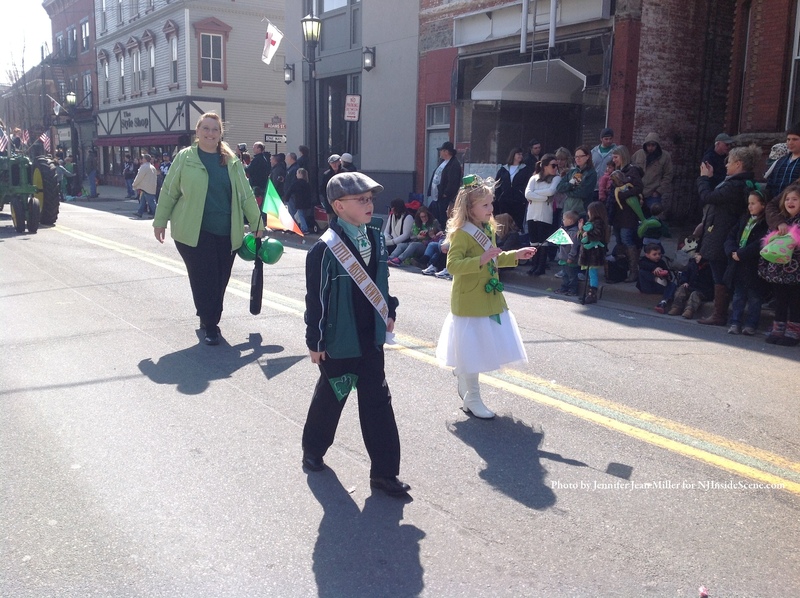 Little Mr. and Little Miss Newton 2013, Matthew Teets and Danielle Penney, wave to spectators. Photo by Jennifer Jean Miller. One of the other highlights of the day was the appearance of majestic horses from the New Jersey Quarter Horse Association. 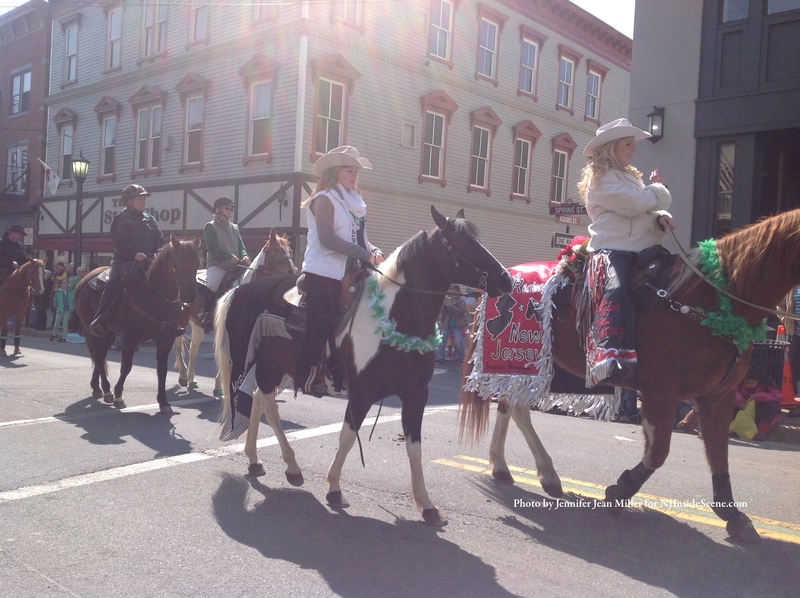 The horses and their riders were outfitted in fancy costumes and many of the horses gracefully trotted, while some literally danced along the parade route. Sun shines down on members of the New Jersey Quarter Horse Association and their horses. Photo by Jennifer Jean Miller. Each year Parade Grand Marshals are chosen. This year there were three, Father Bill Collins, the Pastor of St. Jude’s Parish in Hamburg and Sean and Mike McGuire of McGuire Chevrolet. Past Grand Marshals also marched. Mark Hontz was again the emcee for the parade providing his engaging commentary and singing Celtic songs. Click here to view the parade website and below to see video highlights of the event. Stay on the scene with NJInsideScene.com! Click here to find us on Facebook!